Stereolithography was invented in the mid 80's . In this additive process an ultra-violet laser is used to precisely cure the resin into a solid part. This technology has been advanced by 3D Systems into a more material efficient and precise operation. 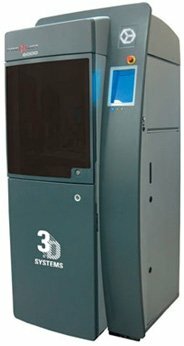 Under the name of ProJet, 3D Systems machines can make parts up to 6 times faster than competing technologies. Additionally, ProJet Systems are able to maintain excellent surface resolution for a much smoother finish. Based on SLA technology, the ProJet uses a UV light to cure layers of material to form a 3D part. These materials offer flexible and high temperature options in addition to many other thermoplastic "like" properties. VisiJet Tough - ABS like, high durability and impact resistant. VisiJet Clear - Polycarbonate like, water clear, stiff and durable. VisiJet HiTemp - heat resistant to 130 C (266 F), chemical resistant. VisiJet e-Stone - used in dental applications and dental modeling. VisiJet Black - Black in color, provides functional snap fit designs and good durability. SLA technology provides prototypes and even short run manufacturing options for consumers who require diverse material options with "thermoplastic like" properties and the fastest build times. SLA and ProJet technology can deliver the functional parts you need faster and more cost effectively than many other manufacturing options.